The spectre of total nuclear annihilation has become “the new abnormal,” according the Bulletin of the Atomic Scientists. The group, famous for its Doomsday Clock, announced last week that the clock would remain at two minutes to midnight, its most threatening position yet. The clock is a qualitative estimate made annually by a group of expert nuclear scientists tracking the likelihood of a man-made existential catastrophe. Since 1991, its hands have continually advanced from 17 minutes till midnight—its least threatening position in history— to its most threatening position to date: two minutes to midnight, first in 1953 and now in both 2018 and 2019. 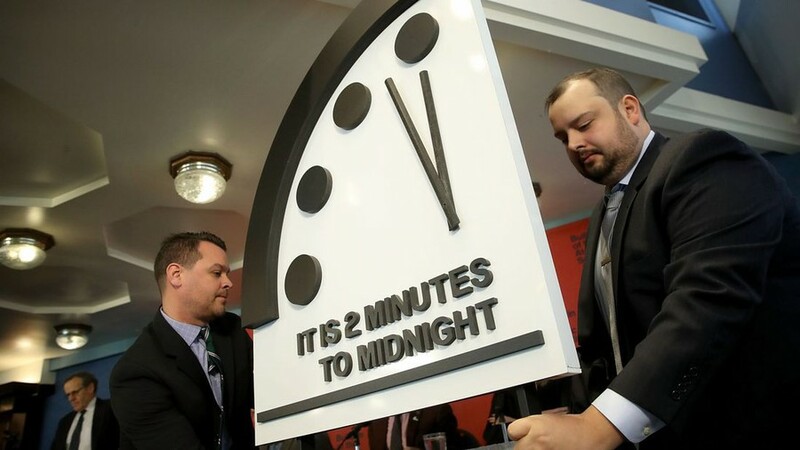 Citing nuclear weapons, climate change, and cyber-warfare among several existential threats, the Bulletin of the Atomic Scientists announced that the Doomsday Clock has settled at around two minutes until midnight. The hands on the clock have not moved since the January 2018 announcement, when they were set 30 seconds forward to two minutes until midnight for only its second time in history. The Bulletin of Atomic Scientists, headquartered at the Harris School, maintains the Doomsday Clock. Since 1947, the famous image of the Doomsday Clock has graced the face of their eponymous bimonthly journal. The artist behind the cover is Meryl Langsdorf, the wife of longtime UChicago professor and Manhattan Project researcher Alexander Langsdorf. “The fact that the hands did not move is bad news indeed,” said Jerry Brown, former governor of California who unveiled the clock with Dr. Bronson. “We’re playing Russian roulette with humanity,” during the announcement press conference. The threat of nuclear annihilation, the Bulletin announced, has returned to a level of brinksmanship not seen before the height of the Cold War. “In the nuclear realm, the United States abandoned the Iran nuclear deal and announced it would withdraw from the Intermediate-range Nuclear Forces Treaty (INF), grave steps towards a complete dismantlement of the global arms control process,” the press release said.